A young Nigerian peddler has been held for allegedly selling drugs to college students and IT employees. Drugs worth INR 600,000 (approximately USD 8400) were recovered from during this address. The man did his business near East Coast Road and Old Mahabalipuram road. This area houses many colleges and IT companies. The 46-year-old man is called Ikechukwu. His motive for coming to India was to get his pancreas treated. However, during an examination, he was not able to produce documents to substantiate his claims. The City police had received intelligence about drug-trafficking taking place in the East Coast Road and surrounding areas. On Sunday night, a team headed by deputy superintendent Purushottamman were engaged in patrol on the East Coast Road. At that time, they noticed a young African national selling something to people in cars and on bikes near a hotel in Neelangarai. He was surrounded and arrested. Six grams of cocaine and 100 grams of ketamine were recovered. Ikechukwu stayed in the Karpapakam area. The samples have been sent to a forensic laboratory and trying to trace others involved in the crime. During the inquiry, he reportedly claimed that he received drugs from a friend based in Goa and sometimes traveled to collect them too. Neither the annual World Drug Reports prepared by the United Nations Office on Drugs and Crime, nor the yearly International Narcotics Control Strategy Reports(INCSR) prepared by the US Department of State, focus too much on India. Compared to global patterns, India is not considered a major producer of illicit drugs. But the country’s geographical location makes it an active point of transit for drugs, either coming from or bound for Europe, Africa, South East Asia or North America, says INCSR 2018. Traditional global opium/heroin hotspots. India is between the Golden Crescent and the Golden Triangle. It is common knowledge that India has extremely porous land and sea borders. Drugs of all kinds end up in India. Moreover, they are also manufactured in the country. To add to this, the rapid modernization and increase in the spending power of the youngsters have created a booming market for narcotics and psychotropics. Within India, metros like Delhi, Mumbai, Chennai, and Bengaluru are major drug consumption spots, but other smaller cities can be major transit points. “If 100 kg of a drug comes to Chennai, about 1 kg will probably enter the city. The rest is headed elsewhere,” says an officer of the Narcotics Control Bureau (NCB). Production of pharmaceutical drugs is one of the fastest growing problems in India as she becomes a major pharma producer. 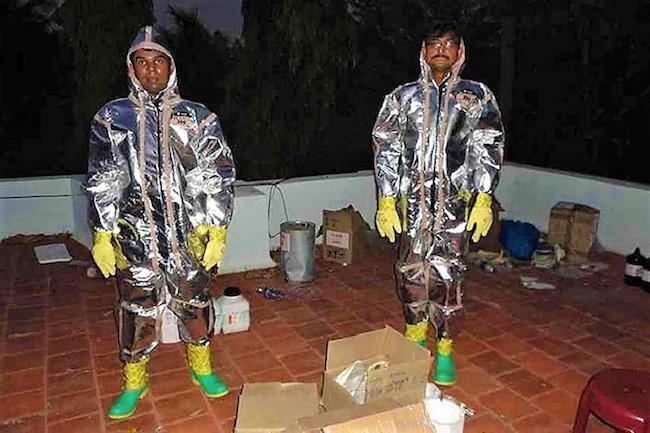 Several meth labs operated by international rings have been busted in the country. Another glaring problem is that the users are becoming the dealers. The challenge for law enforcement agencies is to keep up with the dynamic drug scene in the country. Coupled with this, there is the sheer magnitude of the trade. In a huge country like India, where the departments are always under-staffed and under-funded, there needs to be modern intelligence gathering mechanism which can not only detect if a person has knowledge of a specific crime but can also find out more about his or her criminal affiliations, rang and stature in criminal organizations, linkages between many criminal organizations, use historical data to find linkages, etc. The mechanism must also help cut costs in order to be attractive and feasible. Brainwave Science has come up with a technology which reduces the cost involved in the investigation. In addition to that, it enables law enforcement agencies to avoid the use of coercion and torture as a method to elicit a confession or extract information from an arrested person. Based in Massachusetts in the United States of America, Brainwave Science is a company which believes in the elimination of human suffering from the process of interrogation and investigation. Recently, the Indonesian police had to go to the extent of using a snake to extract information from an arrested suspect. The technology is called iCognative. It can reliably and accurately find out if a person has knowledge of crime-specific details or not. This is invaluable because it helps the investigators to quickly screen the arrested suspects and zero in on the correct one. By using iCognative, the investigators, can, for example, focus on 1 or 2 suspects rather than 10. This means that the investigation is more focused. iCognative is applicable to 85-90% of all civil and criminal cases. Agencies which deal with national security, border control, immigration, counterterrorism, law enforcement, and human and drug trafficking, can all make use of iCognative as an intelligence gathering and screening tool. iCognative does this focusing on the suspect’s brain and his memory centers. When a person plans or executed a crime, they spend a considerable amount of time thinking about. It is important for them and the details get imprinted in their memory, in other words, they know minute details like faces, tools, places, dates, times related to the crime they committed. Investigators conduct an investigation into the crime and look for information. The information which only the perpetrator or accomplice must know is shown to the arrested suspects. At the same time, they are made to wear specialized headsets which can measure their brain responses to the information which is displayed. Images, words, pictures, phrases etc, also called stimuli, are displayed on a computer screen. If the test subject is familiar with the stimulus, their brain reacts in a way. The headset records responses to all stimuli and relays it to the iCognative computer. After a 45-minute test, the results are available immediately. With impeccable accuracy (99+ %), the iCognative system tells if the crime-specific information is present in the suspect’s brain or not. The Narcotics Control Board and police departments must try out iCognative in order to gather maximum information about the trafficking organizations operating across India and beyond, in a cost-effective, quick, reliable and actionable manner.